I started the project with the belief that "if you don't see an item when you dress, you are less likely to think of wearing the item." The project is set out to explore how we can unite the physical space of "wardrobe" to increase to probability of garments-sharing. What goes inside a united wardrobe? The first step is to figure out what kind of clothes could be worn by "everyone". I researched various ancient civilizations' garment and a few modern interpretations. The various research directions led me to a few experiments of using one piece of fabric with minimum cutting and sewing to form "garment" around my body. For Phase II I decided to pivot to making more relatable forms of clothings to maintain people's ability to use common connotations for personal expressions. I started experimenting with the most "universal" clothing item of my possession. 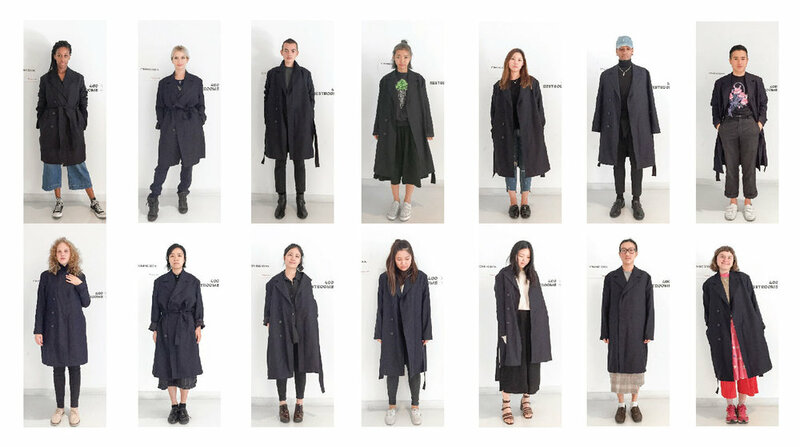 I put a navy trench coat on everyone in my class, documented how they would wear it and interviewed them of their concerns wearing the item. Smaller individual tend to tie a high waistline or wear it intentionally open to show waist line. They also tend to row up sleeves to further lengthen their proportions. Those who tied a waist knot dress more masculine in daily life. Those who wear the coat open dress more feminine in daily life. The most feminine dressing individuals try to wear the coat back, and drop the coat shoulder seam beyond their own shoulders. The largest difficulty I had in Phase II was the range of adjustability I can cover on a garment. I decided to explore interchangeability, which will not have too much excess fabric thanks to individually sized parts. To invent a new kind of closure or pick the best mass-manufactured one? Aiming to make U_A_S an open-source and accessible project, I went with the latter. I had a chart laying out most of the mass-used ones to compare these closure systems on their strength, closing/opening speed, flexibility and of course the appearance of them. Snaps provide good balance of strength and flexibility while buttons are usually lighter-weight and more elegant looking. However, they are both too slow considering the length they need to cover. A connector fails it’s job if it doesn’t encourage interaction. Velcro, magnet, hook and eyes, after a lot of trials and errors the process led me back to the not-so-elegant but very handy closure: zippers. It is fast, it is as fast as it can get without sacrificing strength and stability. Detachability is not a new idea, nor is having shared components within a collection of garments or accessories. 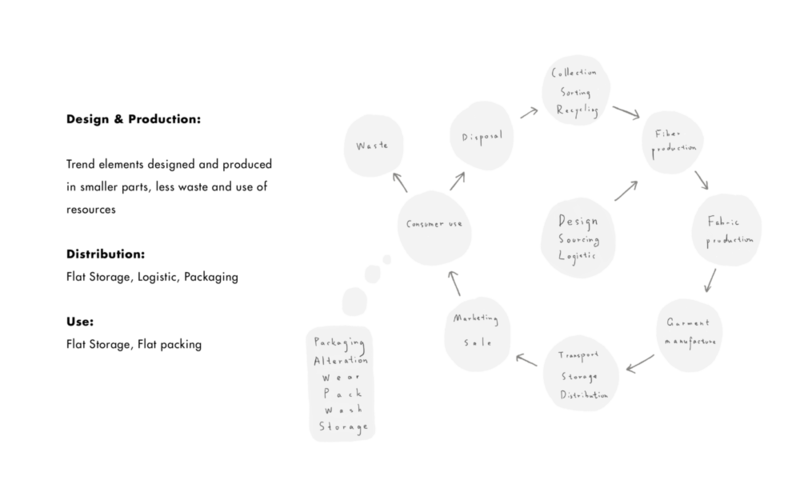 I wanted to create a system go beyond a single designer, beyond the the aesthetic often associated with detachability/futuristic fashion. The system should be something that is neutral to cultures and fashion trends. It should be like thread, people use it without bringing personalities. 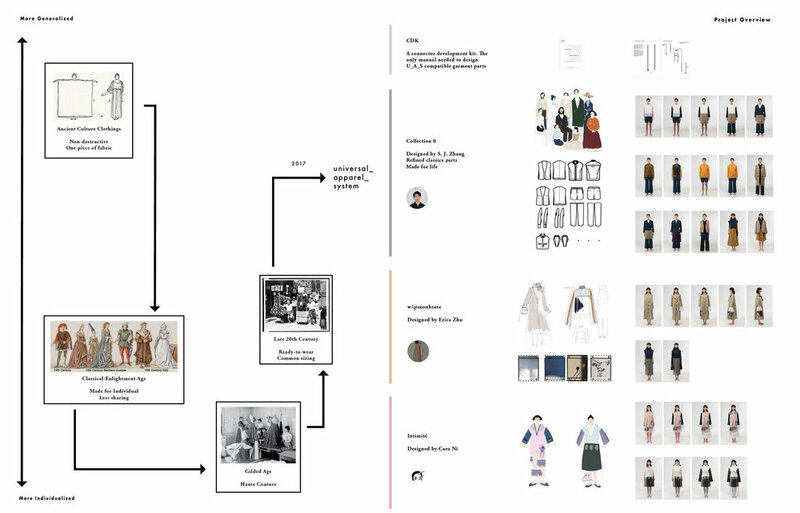 I started by taking apart traditional menswear and code them based on the position of the individual parts and the shareable connector the part may utilize. I coded all the separate parts (articles) with two latin letters representing category/function and two Arabic numbers representing variations and styles. The first digit is a letter indicate the "Category", if the part belongs to a Top, Bottom or Outerwear. The second digit is a number indicates the "Style". This is where aesthetic comes in. E.g. Classic shirting takes 1, knit pullover takes 2. The forth digit is the variation number. E.g. different styles of collars. All parts with the same Third Digit have the same connector. E.g. A1D1 is a pair of sleeves designed for tops, it suggest it may be of a light weight material. However, C1D8 works just the same with the same connector because they are both D sleeves. Having C at the front suggests it’s designed under outwear context, so it may be of heavy weight material and lined with silky fabric. The same case //H/s are close loop extensions which are essentially tubes. They work with both pullover tops and skirts. A/H/ are designed under top extension context while B/H/ are more for skirts but as long as they share the same dimensions, they work together. In Universal Apparel System, all the separate parts are sized by visual effect: Small, Medium, Large. Specific items with unusual proportions could have the measurements marked on the sizing tags. There are specific measurements (usually length of zippers) of connectors that are compatible to different connectors with their length marked on the sizing tag. 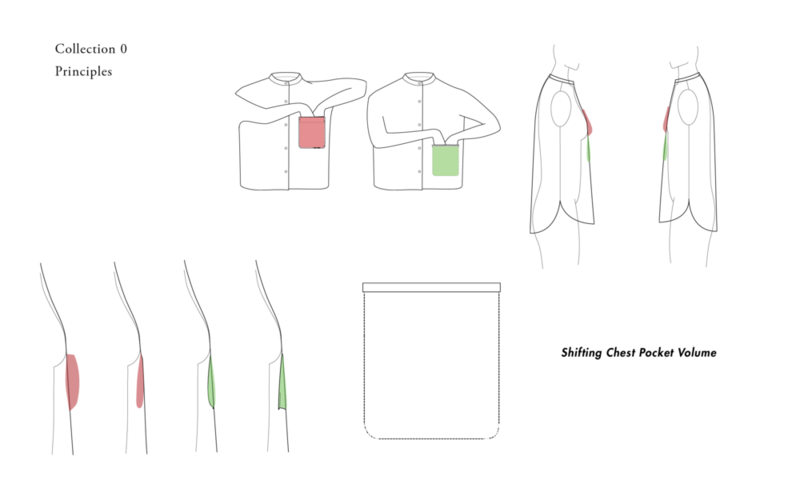 Universal Apparel System can be appropriated into many forms as long as connectors stay universal. Shoulders and waists can be tailored as well as pants extension can be hemmed to desired length. This Kit features an Editor's Letter that I talked about how the project came to be. How parts are coded, sized. 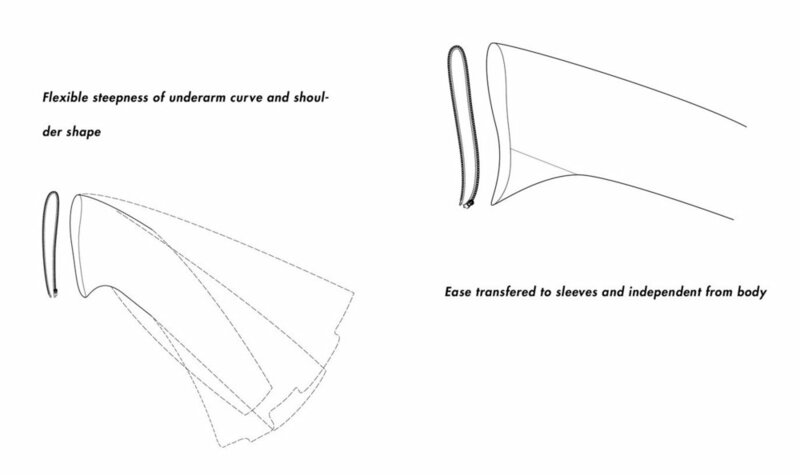 How to make & adapt clothing patterns to work with Universal_Apparel_System. Everything one needs to know about the open-source part of this project. 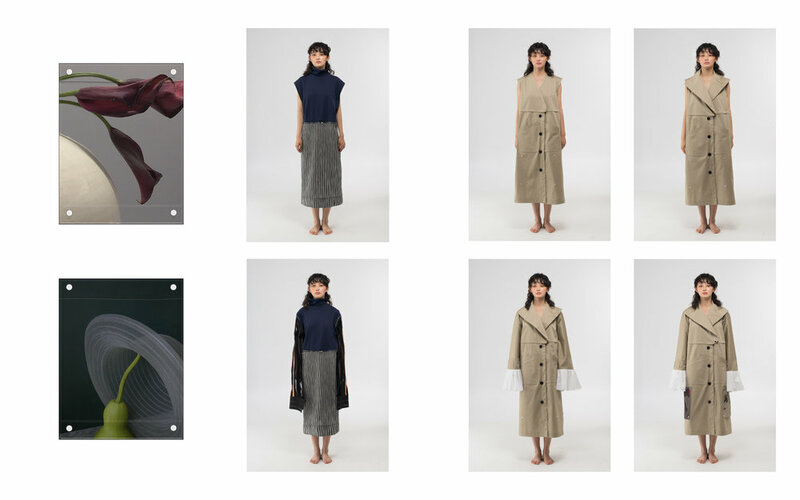 Zero is designed to be the fundamental pieces for an understated, versatile and functional wardrobe for all genders and wide range of body shapes. It aims to updated from classics for a contemporary lifestyle through refined silhouette and construction details. For lighter weight tops, a traditional chest patch pocket is not only lowered but also transformed into a single-welt pocket patched from the inside. Dropping of the pocket position give the overall structure a more relaxed visual effect. Combining the best of shirt pocket and jacket pocket, a single-welt pocket patched from the inside is featured on a lot of Collection Zero pieces. This construction shift the pocket volume from outside into the back of shell fabric. The pocket body can be pleated or add gusset to create extra hidden volume. On the surface it looks like a single welt pocket with pocket-bag-shaped top stitch. Since it is single layered on the inside, there is no need for interfacing and can be left soft and flexible. Erica Zhu, the curator behind @monbraee has peculiarly equisite taste on everything about life. Paris-based illustrator Caro Ni imagining detachable clothings.